Have you ever wanted to know what do you have to do tomorrow or in the next week without checking your agenda? This dynamic datepicker calendar will allow users to click on a date and see the events. It’s easy to create and very useful. The best part is that only the dates from the calendar that contain events are the clickable ones. Only by watching you will quickly see in what days of the month you have events. Now let’s begin! This is the file you’re going to see in the browser. This file is the most important one because it contains the link to the JQuery libraries and the stylesheets. Now that we’ve included the libraries, we have to add the output somewhere in the page. For this we’ll use 2 div elements (remember their ids because you’ll need them in the code). You don’t need to populate them. Just leave them like that. This is just an example of what you can obtain in the dialog box. You can also add a date (or anything else). There’s no limit. In events.php, take all the events and put them in array. Now encode it in a json. NOTE: I recommend you to customize this function and take only the events from the month/year where you have a large database. Is there an easy way for the popup text to use html markup? Is there a way to go to another page and use the event_id in a URL query string? The reason for the event_id over a date is so you can handle date ranges such as where an event lasts multiple days. I hope this is what you needed. Wow you make it look so easy… Thanks. May I ask another question… what if you have a date range. How do you make the calendar show a range from a start date to an end date and still retain the recordID as you have demonstrated above? This seems considerably more difficult as you would need to figure cross month dates. Thanks again! I’m not sure what you do you want to do, so I have to ask you first…do you want to have events that last several days (like event4 from 2012-2-15 to 2012-02-18)? And when you click on to one of the days from that event (let’s say you click on 2012-02-16) you want it to go to events_details.php?id=4 ? Waiting for your reply to see exacly what I should explain. Then as you say, either one links to their respective event_id which allows me to construct a event detail page populated if any of the dates are selected when there is a multi-day event since they all share the same event_id. And this way it doesn’t matter if a event goes from a month to another. I hope this is what you need to do. Thank you Andrea. May God bless you greatly. 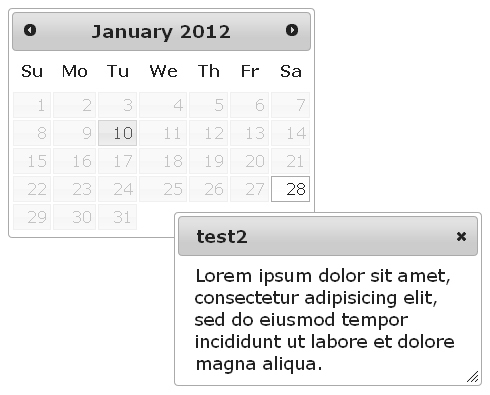 Dynamic Jquery Datepicker calendar, which was the need for the system reseras I’m developing. Good Afternoon, I would like to know how to show two events registered on the same date. I hope this helps you. Have a nice day! Good morning, I’m still a problem and doubts. problem: When the bank records date with two different title, to open a evendo in the calendar it shows me all right, when closing and opening another event that he shows me the title of an earlier date. Doubt: it would be a doubt, if I want to leave the dates enabled for the User to choose a date to book, is? and has more than one place as a title data because the environment would be the title, a date and may be over a different environment. I thank you note. Very good code, only that I returning an error, say the bank added two events: an event on 27/04 and another on 28/04, with different titles, when I open the dialog the first 27 days and then 28 days does not change the title, only changes when I update the page and open the other day. Andreea is to create a table inside the dialog, where in my print column in another column event and the event time?